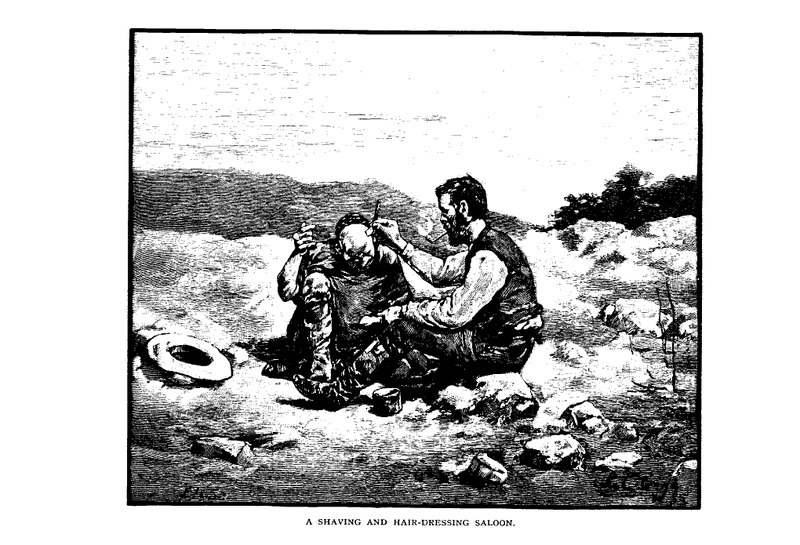 A man by the name of John R. G. Hassard wrote the following narrative of his “camping expedition of sixty-eight days” in the Ventura County backcountry of California. 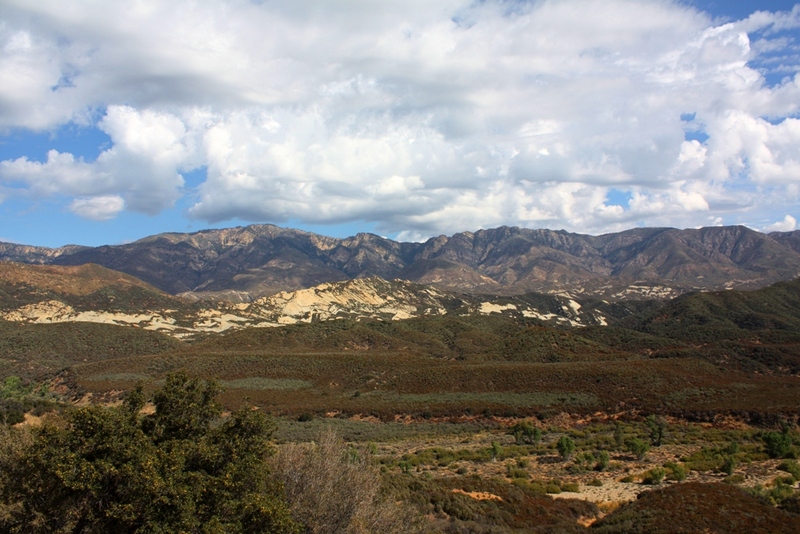 As an aside, Ventura County was created on January 1, 1873 and was split from and taken out of Santa Barbara County. The story was published in March 1887 in The Century, a popular quarterly publication of the time. 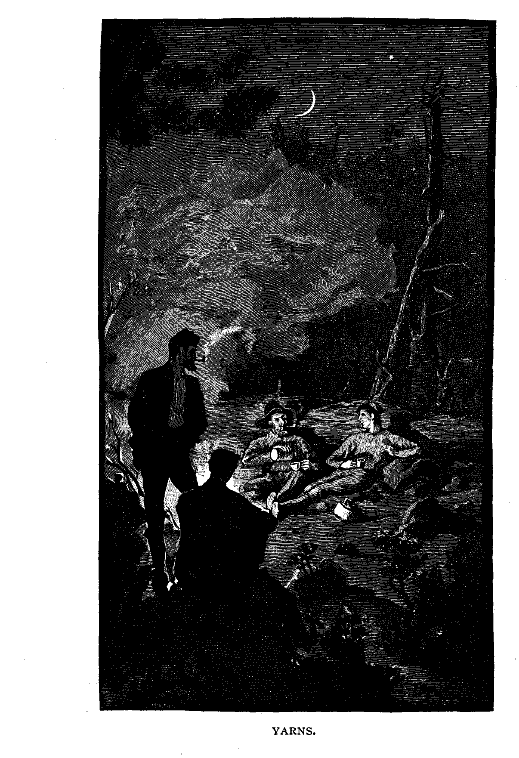 The black and white drawings accompanied the story as originally published. 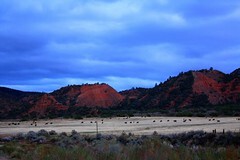 I have added color photos of some of the places mentioned. Camping out is a common family amusement in California; but when our party took to the woods the experiment was regarded by friends with curiosity and some mistrust. We had chosen a very difficult country, and yet we meant to live in unusual comfort. 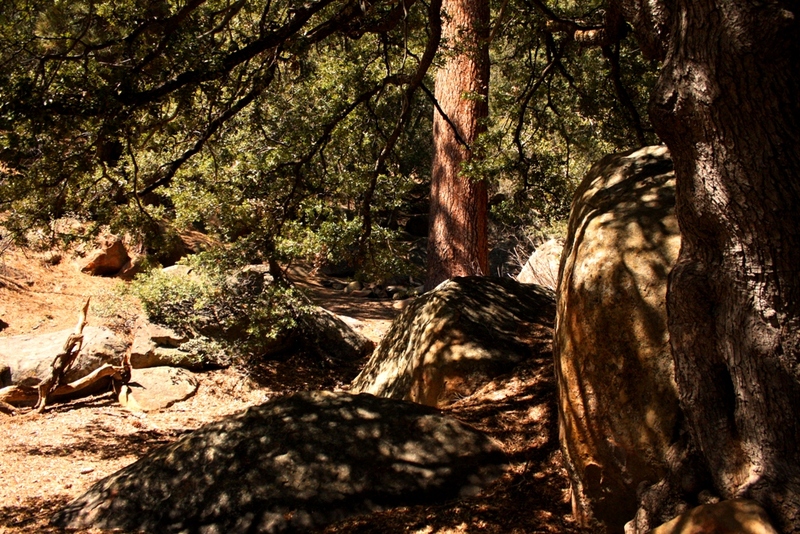 We were going into the mountains of southern California, far from roads or settlement, and our scheme was to carry into this wilderness all the equipment of a modest summer home, and to live there for a few months with a degree of luxury which the guides had never seen in such a region. Our attempt was entirely successful. The camp was maintained in excellent style for ten weeks, and was then abandoned only because there was no more forage for the horses. In these pages I propose telling how we lived without hardship on a remote mountain, hunting, fishing, exploring wild places, and idling in the shade of the pines. We were five comrades, including one lady, and we were served by a guide and a Chinese cook. Our point of departure and base of supplies was the little hamlet of Nordhoff, which lies in a mountain valley full of live oaks and flowers, fifteen miles from the coast and forty miles from the town of Santa Barbara; and our objective point was a long ridge called Pine Mountain, which rises boldly to a height of six or seven thousand feet among branches of the Coast Range, twenty-five or thirty miles from Nordhoff. 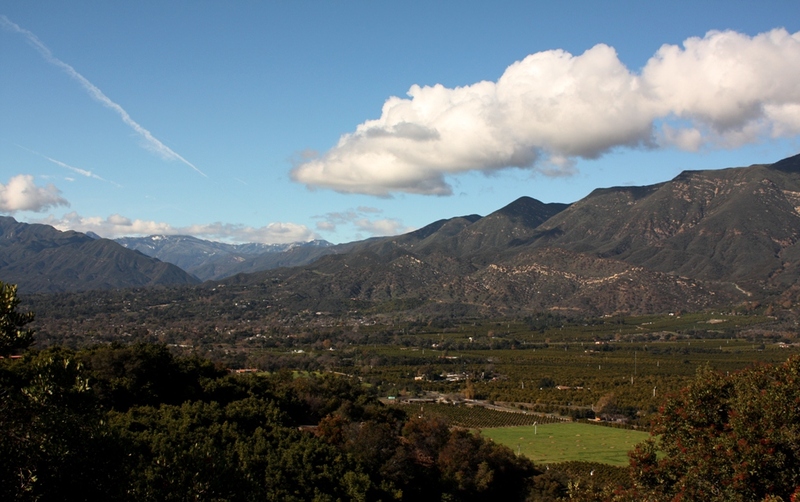 “. . .the little hamlet of Nordhoff, which lies in a mountain valley. . .” Today that hamlet is known as the town of Ojai. 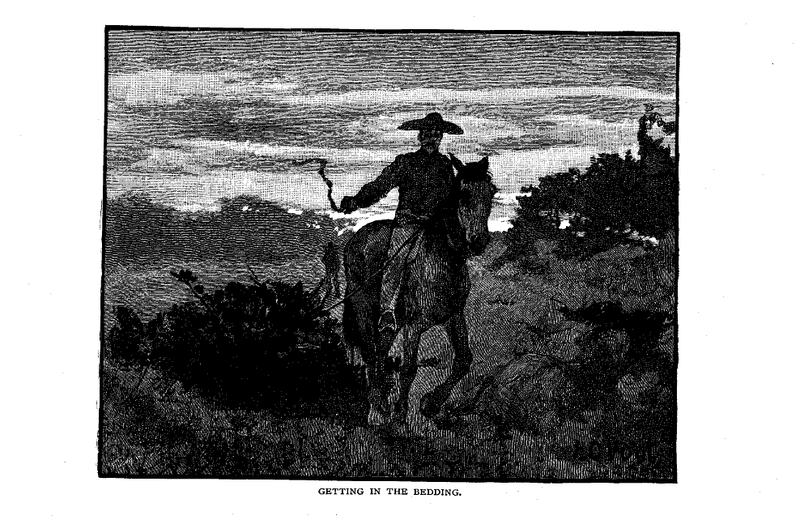 The mountain can only be reached by a rude and arduous bridle-trail, so little traversed that in many places it is nearly lost in the woods and chaparral; and the serious work of our expedition was to pack our abundant luggage on horseback over this path, and to get fresh supplies at frequent intervals by the same route. I say frequent fresh supplies, for we determined at the outset not to depend upon the coarse bacon and canned provisions which form so large a part of the ordinary campers’ fare. Our load when we started was not less than one thousand five hundred pounds, including tents, bedding, cooking utensils, tableware, clothing, and about ten days’ rations; and as a good burden for a horse on a hard mountain trail is two hundred pounds, we had enough to pack at least seven animals, besides the seven for our own riding. But a train of fourteen horses was more than we could easily subsist on the road, nor did we wish for the care of such an extensive stable. We moved, therefore, by short marches in two divisions. 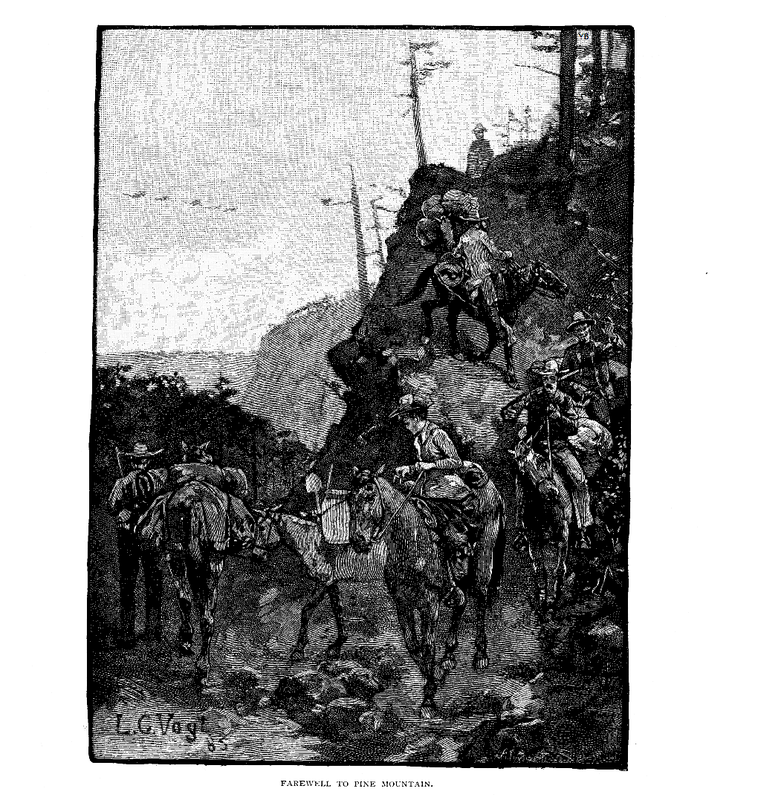 The guide went first, with four baggage horses and two riders, and as soon as camp was pitched for the night he returned for the rest of the party, driving all the horses in a string before him. The next day the rear division closed up with the advance. In this way seven horses were made to serve for the whole work. It is true that the guide and the animals had to go over the entire route twice, and that we made slow progress; but we were in no hurry; and some of the pleasant days of our summer were those we spent on leisurely marches or consecrated to rest for the tired beasts. It almost broke his heart to give up the jar; but he saved a bottleful of the precious leaven, and mounted it to the top of the luggage, where I believe that not more than half was spilled on the mattresses during the journey to the first camp. And so our merry party, with much cheering, and with handkerchiefs waving from windows and doorways, rode out of the village. But I have forgotten the cow! When we first spoke of taking a cow into the mountain camp, people thought we were joking. Then they came to the conclusion that we were rather “too fresh” for California. But we saw no reason why a cow could not go where a horse could go; and Soper, being consulted, gave the plan his entire approval. The handsome and amiable little Jersey which we thereupon chartered for the expedition proved one of the most valuable members of the company and gave us no serious trouble. 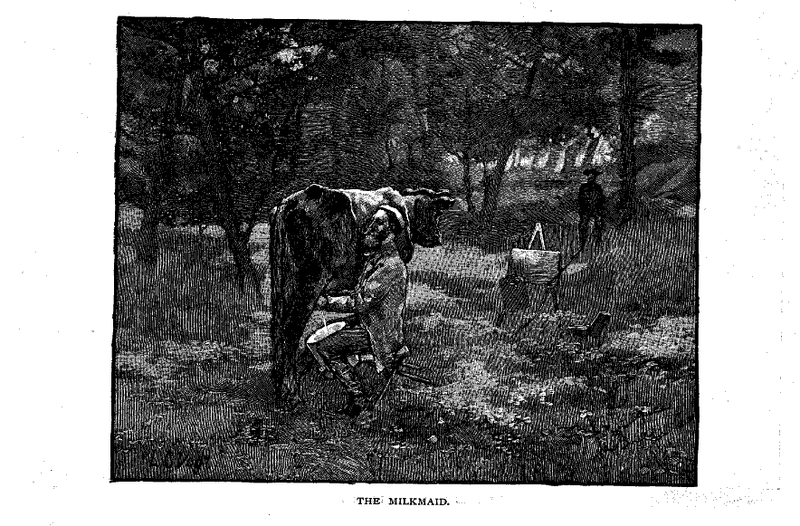 Two or three times, indeed, she slipped away, and started for home with uncommon energy, like the cow that knew her own mind; but the very clearness of her purpose made it easy to find her, for she kept in the trail, and, though she traveled fast, we always caught her after a moderate chase. If she had reached Nordhoff, I do not know whether we should have cared about reclaiming her at the cost of facing the hilarious villagers. We cantered across the upland, through fields of grain which brushed the horse’s shoulders; we threaded a live-oak wood, where all the ground under the trees was dotted with brilliant flowers; and when we reached the wall of mountain which bounds the valley on the north, we found ourselves at the mouth of a rough and burning ravine called the Matilija Canyon, strewn with boulders, faced by bare rocks or thinly clad hills, and populous with horned toads, rattlesnakes, and other interesting reptiles. This was the forbidding gateway to the picturesque region we had chosen for our camp. A rapid brook runs down the canyon; shrinking into the the deserted bed of what must once have been a broad river, and here and there the gravel spreads far over the desolate bottom. But soon after entering the ravine, the eye is relieved by patches of wood and verdure which at short intervals break in upon the sand. The rocks, taking imposing and fantastic forms, nearly close upon the trail, which crosses the stream repeatedly, as it is crowded from each steep bank in turn. 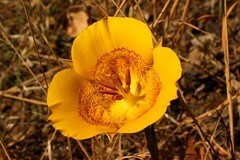 Even the rudest stretches of the Matilija are famous for their flowers. The glory of the meadows and barley fields, of which all travelers in this gorgeous State have said so much, was fading when we began our journey, but in the Matilija the blossoms linger later and attain a richer color and an ampler size than in the open country. 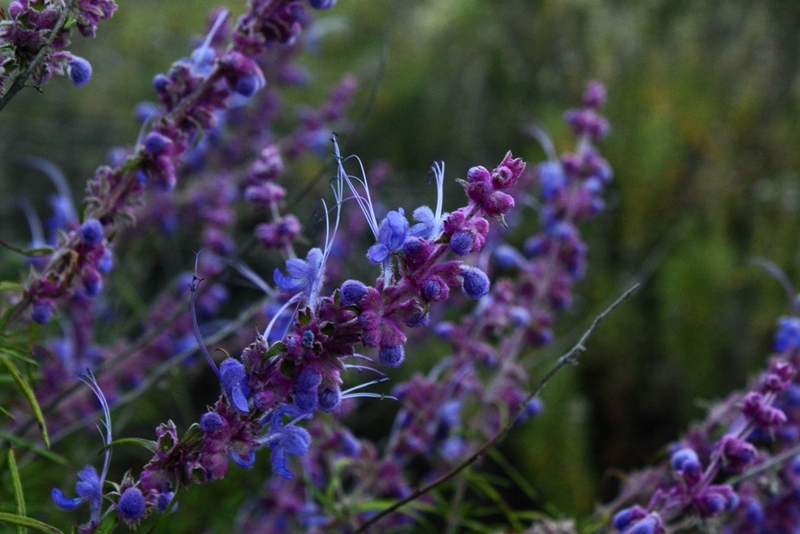 Woolly Blue Curls (Trichostema lanatum) growing in Matilija Canyon. The brush was all in full flower as we rode past; a wilderness of sage burdened the air with perfume; many of the slopes were vast masses of blue and yellow bloom; and myriads of bees so filled the valley with noise and excitement that I could only think of the Matilija as a great honey-factory. The wagon-track, in fact, was made for the convenience of a few bee ranches set up here in the midst of the chaparral (one of them belongs to our guide), and at the bars of the last of these rude inclosures the mark of wheels comes to an abrupt end. We made our first halt near the head of the Matilija, where a flat basin among the hills, with a grassy bottom fringed by sycamores and willows, a thicket of alder on the banks of the stream, and a profusion of flowers at every turn, made a tempting spot for the pitching of our camp. We turned the horses loose, and while the lady and the cook prepared our first meal, the rest of us unloaded the wagon and opened bales and boxes. We established the Chinaman in a commodious kitchen, consisting of a willow-tree, a sheet-iron stove, and an open fire for the kettle; and presently we were seated on the ground disposing of a miscellaneous picnic lunch, to which exercise and exhilaration contributed great appetites. We had a merry and busy afternoon, setting up our tents on the edge of the wood; building a dinner-table (for which we brought the top in short sections of light half-inch redwood, and spreading an awning over it; cutting branches for our beds; making rustic shelves around the trunks of trees; and arranging our stores. A late dinner of steak and potatoes closed the day, and we went to bed tired and happy. We spent two weeks in this pleasant camp; and how short and delightful were the days! There was no worry about weather, for between May and November no rain ever falls in this region; and although the sea fogs sometimes reached us at night, the days were always bright, the heat was moderate, and we were high enough above the ocean-level—one thousand eight hundred feet—to catch fresh breezes that were not felt in the valleys below us. A cold spring tumbled into the brook a few rods from our tents. In mid-stream was a shady island of smooth gravel, where the gentlemen spread their rugs in the afternoon, smoked, and read novels; and there was a clean, deep pool in which they bathed. 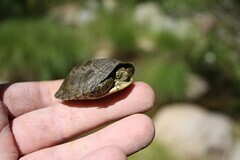 Fishing was the principle sport, for the Matilija abounds with trout. Every morning before light two or three of our party crawled from their couches, took a slice of bread and a draught of milk at the willow-tree which we called the pantry, and were ready at the first glimmer of dawn to whip the stream. Every evening after dinner they took their rods again and fished as long as they could see. Sometimes they made all night excursions to the upper waters of the Matilija in the mountains, and followed them down to the camp. There was a flavor of adventure in these expeditions into the dark and lonely woods, with the suppers of bacon and freshly caught trout, and the late lingering over campfire coffee; but the fishing was quite as good near home. The Dolly Varden trout, which is caught in these California brooks, is named from the brilliant and varied colors of its sides and belly. Certainly it is gayly and coquettishly adorned, but it does not excel the exquisite speckled trout of our own waters either in beauty or in flavor, nor will it rank very high as a game fish. No special art is needed to take it; worms, flies, grasshoppers, bits of bread or of meat—it swallows them all with undiscriminating appetite. If it has any preference in the matter of diet, it is for the eyes of its own companions. When other bait ceased to allure, we used to put a trout’s eye on the hook, and the sport revived. I think with a few accidental exceptions we had trout with every meal as long as we remained in this camp. Farther up we afterward found still finer fishing. There was a spot on the left fork of the Matilija where the doctor and the Chinaman, resting a day on the march to the mountain, hooked trout almost as fast as they could throw their lines. Here Ah Hing performed his great exploit of catching forty-eight fish with one worm, which has always seemed to me the most remarkable illustration of Chinese thrift in my experience. There is no doubt about the fact; no worms are found in the arid valley, and as our supply, brought from Soper’ ranch, was small, the doctor put Ah Hing on an allowance of three, two of which he afterward returned. Venison was scarce at our camp, and although the guide and two or three of the most earnest of the party made long marches and spent watchful nights on the mountains, they saw only one deer, and him they did not kill. The deer hunting was to come later. There was other game, however, in plenty. Wild pigeons abounded; and the beautiful crested valley quail—a much more handsome bird than our eastern bob-white, but not such good eating—could be got with very little trouble. We had no dogs, but we seldom lost a bird, and our larder, a convenient branch overhanging the pantry shelves, rarely lacked the materials for a pie. Nobody seemed to make a business of gunning. It was the recreation of odd moments—I was going to say of idle moments, but we were always idle in those happy halcyon days. When a man was tired of his pipe and his novel, he strolled into the grove or up the canyon, and came back presently with a good bag. Even the cook took his share in this easy sport; but to him, unlike the others, the enterprise was one of wild excitement. He crept after birds with the stealthy tread of a cat. He never risked a long shot, and never was quick enough to fire both barrels, but his luck upon the whole was very fair, and when he returned the hills echoed with his exultant cry, “Ho, I catchum pigeon—t’ree, four pigeon!” He brought in rabbits also, for the stewing of which he had a great knack; and we recognized the shout, “Ho, I catchum labbit!” as the prelude to a savory dinner. “I don’t know how you call them in English; they are about so long”—indicating three inches. We never found out what he meant. When the forage began to fail we broke camp and entered upon the different part of our march. We had come to the end of the road, and the mountain trail which lay before us was so rough, so steep, so crooked, and so much overgrown that the pack horses had to be loaded with extreme care, lest a too prominent pot or projecting broom-handle, catching in the brush or striking a rock, should throw them from the insecure path. When the last of us, after an early breakfast, rode out of the dismantled camp, we looked back with sentimental regret upon the shady thicket, the acres of flowers, and the rustic chairs and tables left as relics of the occupation. We should have been melancholy indeed if we had known that the spot would never look beautiful to us again. When we returned at the end of summer, the hills above it had been swept by fire, the axe had been laid to the trees, and an adventurous ranchman was clearing the land for pasture. A little way above the camp the Matilija Canyon splits into three narrow ravines, each traversed by a fork of the stream, and each shut in by high mountains. Our route lay up the pass on our right hand, and after we had twice forded the water we turned sharply at the foot of a projecting height, and began to ascend. We twisted and doubled so often around spurs of the range that we soon lost the points of the compass. The trail kept close to the brook (when it was not actually in the brook), and indeed there was not room for it elsewhere. We threaded defiles, we crept through dense copses, we bent low over the horses’ necks to penetrate stretches of wood, we forced our way through the bush by main strength and left rags fluttering on the thorns; now and then we crossed a broad, flower-spangled basin, or trod a treacherous path on the sandy flanks of a mountain amphitheater. Grandeur of outline, splendor of color, and variety of character are the distinctive charms of the California hill-country, and in this entrancing journey we had a rapid succession of pictures not less remarkable for their contrasts than for their beauty. The ascent was steady and rapid, and when ever we came to a clear height we looked back in surprise at the canyon below. 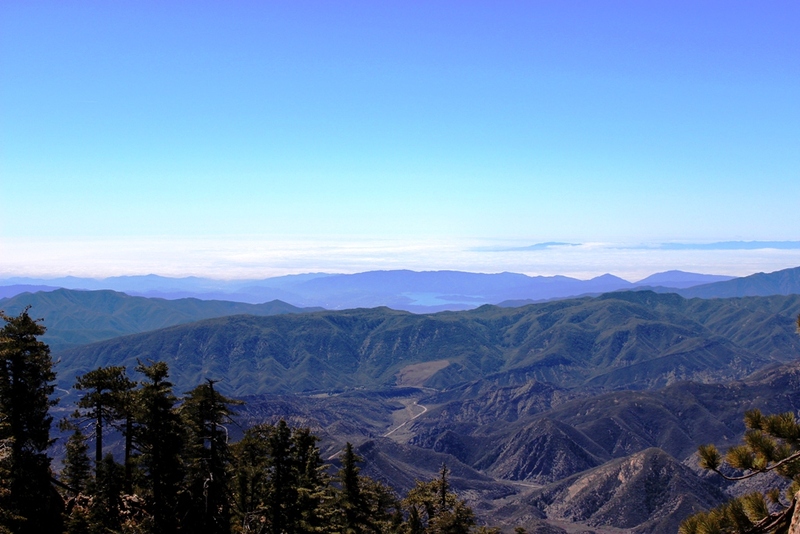 Sometimes a magnificent vista of blue mountains and broad valleys suddenly opened before us, fading in a hazy and mysterious distance; and when we reached the crest of the divide which separates the head-streams of the Sespe and Ventura rivers, we turned and saw beyond the mountains the Pacific Ocean like a pale mist. The journey was principally a scramble, and the lady had ample reason to applaud the sagacious guide who advised her to use a man’s saddle; a side-saddle would certainly have brought her to grief. 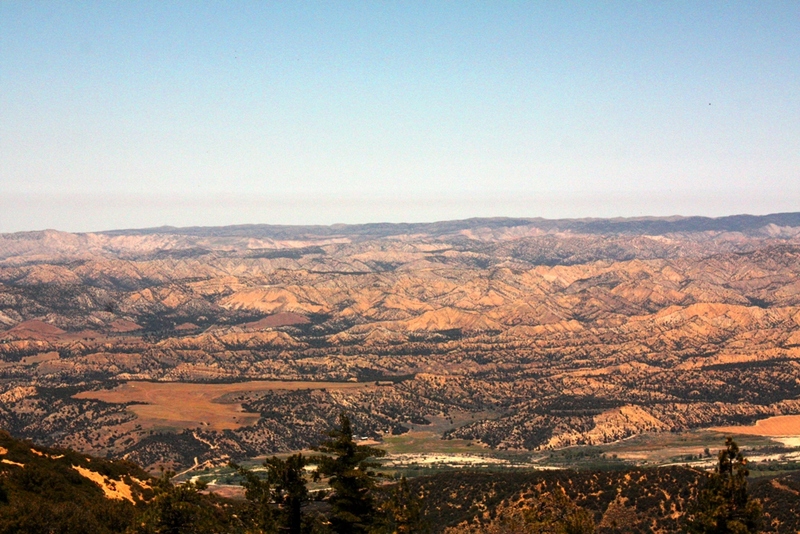 The last stage of the ascent of the divide—and unnamed portion of the Santa Ynez range—was a terrible climb of about two thousand feet through stunted shrubs. We had hardly breathing-time on the narrow top before we plunged into a dark pine wood, and began an equally steep but more gradual decent. The gloom of the forest was intensified by the blackened remains of burnt trees. Nearly half the timber had been scarred by fire, and much of it killed. Mighty trunks, six feet in diameter, lay stretched along the ground. Here and there the fires were still smoldering. Looking forward we sometimes saw sunlight on the foliage in the distance far below, but our somber path through the black valley was like one of those weird scenes beloved by Dore, in which dense shadow lies under towering, gigantic branches. At the foot of the ravine we issued into a broad, hot, sandy valley, overgrown with tall grasses; and in front of us, parallel with the range we had just crossed, stretched the long ridge of Pine Mountain, upon which we were to pitch our final camp. After we had crossed the valley we had a hard climb of three of four hours, first through a narrow gorge, and then along the crests of the outlying ridges, and at last, in the heat of the afternoon, we reached the grateful shade of the pine-covered summit, and rode in a beautiful open wood, free from undergrowth, where the eye lost itself in innumerable charming vistas beneath the lofty boughs. We spent a week on the road from our first camp to the mountain. Once we set up our tabernacle in a group of bay-trees, and made our beds of the fragrant branches. Again we halted in a copse by the Sespe River, where we caught trout of prodigious fatness, and refreshed our horses in a succulent pasture, while Soper went back to Nordhoff for supplies. We did not pitch our tents during these wayside stops; we spread our blankets under the trees, and reduced the art of living to its simplest elements, so that the packs should not be disturbed more than was necessary. 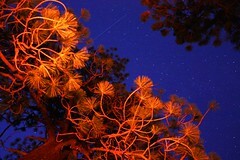 Even after we reached the mountain, it was ten days before we resumed the luxurious habits of our camp in the Matilija. We went first to a deep and narrow glen on the south face of the mountain, where a beautiful spring issued from a cave; but this spot had no recommendation as a camping-place except the water, and we presently settled ourselves on the summit. Here we had incessant breezes, abundant shade, space, variety, verdure, forage, and a superb outlook over valleys and mountain ranges, with the sea and its islands in the distance. But, alas, we had no water; that had to be brought from the glen, about a mile distant, the trail comprising a breakneck ascent of five hundred feet which was much worse than anything we had passed on the journey. If we had realized the full extent of the water difficulty before starting, we should have directed our expedition elsewhere; and indeed I must confess that, in many respects, Pine Mountain, as a camping place, is open to objections. I will not rehearse them all, for I am more concerned to show how one can live comfortably in camp than where one can so live. Having determined to pack water from the spring to the summit, we obtained four square tin honey cans, each holding five gallons; they were furnished with screw-tops, and were set in two oblong wooden boxes, to which cords were attached for lashing them to a packsaddle. A horse-load was thus twenty gallons, weighing, with the boxes, nearly two hundred pounds, and we used, with great economy, three loads in two days. 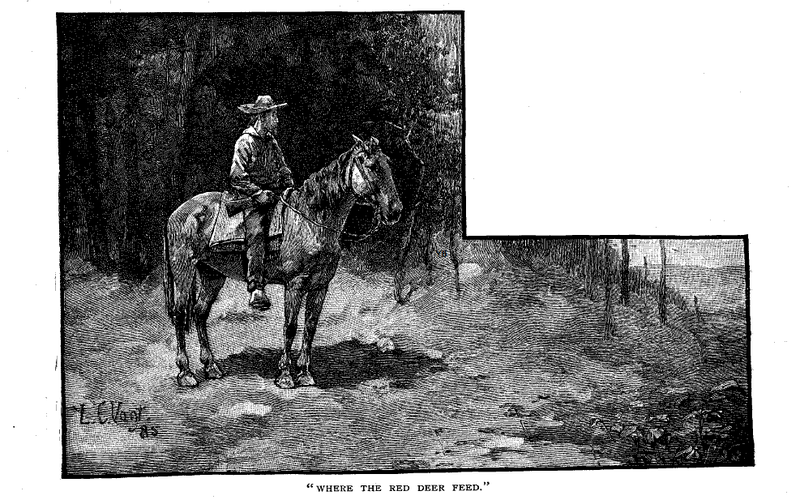 Getting water over that nearly impossible trail was hard work for both man and horse, and it made a dreadful inroad upon the day, especially when it happened, as it often did, that the horse could not be found when wanted. The horses ran loose all over the mountain-top, and though they wandered far, they never went down into the valley, or let more than a day pass without paying us a visit. Soper got the water vessels for us the first time he went down for supplies, and as soon as they arrived we moved out camp. The spot we chose was a gentle slope looking toward the south, well-shaded by an open growth of huge white pines, quite clear of brush, and reaching in front to the edge of the mountain, while in the rear “big bunches of rock,” as our guide called them, divided it from a beautiful little depression in the very crest of the ridge, and from the dense growth of timber which extended thence down the northern slopes to the foot of the range. The parallel ridges in this part of the country, running east and west, are thickly wooded on their north face, and treeless on the south. From our mountain-top we could look both ways. I never got used to the startling change in the effect of the landscape produced by merely turning around. But in one respect it was all alike; neither on the side of the dark-green forest nor in the melancholy quarter of bare red hills and sandy wastes was there a sign of human life—not a house, nor a fence, nor a road, nor a tilled field. In the midst of our grove we set up a capacious table, which not only served us for the meals but marked a place for social gatherings. We leveled a broad platform, raised a stout awning-frame, made benches of split logs, and built on the north, or windward side, a thick screen of wattled hemlock branches, which we hung with sundry housekeeping articles, and decorated, after a while, with deer-skins, and other trophies of the chase. At one side was suspended a vessel of drinking-water; at the other was a little covered fireplace; with a flue running so far back into the hillside that smoke would not annoy us. Here we made the coffee and and kept the dishes hot, while Ah Hing held undisturbed possession of the kitchen. That department was about two rods distant, in a clump of fine trees, and was nearly surrounded by a wind-screen of hemlock boughs and odd pieces of canvas. With poles, and lengths of split pine, and a few empty boxes, the cook made a dresser and a set of shelves. We had an excellent stove of sheet-iron, highly effective and easily transported. It was about three feet long, eighteen inches high, eighteen inches wide; it had no bottom, no legs, nothing that would break; the pipe telescoped and went inside; the weight of the whole was eight pounds, and the shape was convenient for packing. On the march we turned the stove upside down and filled it with saucepans and the camp library, this collection of books comprising a large supply of portable literature in the Franklin Square series and similar publications. As an appendix to the stove, we had a deep sheet-iron roasting pan, with a tight cover, a Dutch oven served for baking bread and pies, and there was a huge open fireplace, backed with stone, before which we hung haunches of venison too big for the roaster. We built a substantial meat-safe, with sides and top of mosquito-netting. Shelves around the trunks of trees held our other stores, and a closed cupboard, fastened to the trunk of a tall pine, answered for a dairy. As it never rained, and insects were not troublesome, our groceries needed no protection except from the sun and the dust. 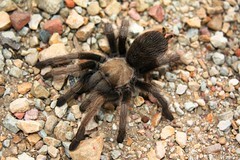 In our sleeping arrangements there was a great deal of diversity. The different members of the party placed their beds far enough from one another and from the common center to secure a reasonable degree of privacy, and sought, moreover, the protection of masses of rock or groups of trees. We all lay in the open air—all except the Chinaman, who would have his A tent, even on the march, being persuaded that it was a necessary and sovereign safeguard against bears and snakes. Some spread pine boughs on the ground and put a blanket over them; others built rustic bedsteads. The lady and her husband had light wool mattresses, not more than two inches thick, and so flexible that they were easily rolled up for transportation on horseback. These, placed upon branches of white pine and close top layers of hemlock twigs, carefully set with the cut ends down, made soft, springy, and luxurious beds. Several of us brought sacking to make cots, but the experiment, which we tried only in the first camp, was not successful—the cot-frames broke down, or the canvas sagged too much; the pine branches were both simpler and more comfortable. Whether it is better to sleep on the ground or on a bedstead is a disputed point. Experienced friends gave me contradictory advice. Assuming that you lie out-of-doors (for that is by far the pleasanter plan in a dry climate), you will need, if you build a raised bedstead, at least one thick blanket under you, and perhaps two. Even a light mattress will not be a sufficient protection unless you are in a spot much better sheltered from the wind than the top of Pine Mountain. But, while the ground is undoubtedly warmer than a bedstead, it is, on the other hand, very dirty. On such a couch the bedding soon becomes filled with dust and dead leaves and miscellaneous refuse, and you will be fortunate if the vagrant breezes do not deposit much of their burden in your face while you sleep. A tent is unnecessary in a climate like that of the California summer, but it is a great convenience. There were two wall-tents in our camp, each about ten by twelve feet. F— used his only for a wind screen after we reached the mountains. The other was occupied by the lady and her husband as a dressing-room, their beds being placed just outside the open door. They had a floor-covering of striped canvas, pulled tight and tied to the tent-pegs, and under this they spread a thick layer of pine-needles. This gave them the first of all luxuries in a camp life—a clean place for the toilet. The greatest affliction of this savage existence is dirt, and the greatest comfort is a basin of water. Of course when there is a lady in the party, shelter of some sort is indispensable, however fine the weather. Huts can be built of boughs, but to build them properly takes a great while, and for some days after first going into camp everybody is busy with work which needs instant attention. Bough huts, moreover, are but a poor protection from the wind and the dust, and in a mountain country both these visitations are apt to be troublesome. With a tent you can at least be sure of a tolerable tidy retreat, and it is surprising how easily it is carried. Tent-poles we cut in the woods as we wanted them. Our party hunted in moderation. Two of them took to the woods for the benefit of their health, and those who were better able to carry a gun did not depend upon shooting for their daily amusement. They read, they sketched, they strolled about the mountain in search of the picturesque, they made excursions on horseback to various parts of the long ridge and to the valley below, they lounged and chatted in the shade. The ordinary work of camp and the construction of chairs, tables, washstands, and innumerable little conveniences gave everybody some occupation. We had a few carpenter’s tools, and they were never out of use. We breakfasted at seven, lunched at twelve, and dined at six, and when we left the dinner table we gathered around a large fire in the midst of the camp, and listened to the guide’s stories until drowsiness overtook us. Soper, having business of his own on hand, left us as soon as we reached the mountain-top, but he sent an excellent man in his place. The new guide was a very quiet and soft-voiced person, who said “sir” when he spoke to us, while Soper always addressed us as “you fellows.” We never decided which was the better guide or the pleasanter companion. I liked best his tales of the forecastle. They were not at all exciting; they were novels of character and manners rather than of incident abounding in “says I” and “says he,” and running on indefinitely with a placid and soothing movement which disposed us to peace and content. At the end Harvey always laughed gently, and we followed him; but I do not think that he expected this tribute. I dare say that the art of telling stories like these is only acquired on long voyages. 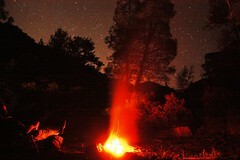 Sometimes an element of drollery in the tales, which we missed while we stared at the fire in the sleepy evening, came to us the next day with a new relish. I remember in particular a long and minutely detailed story about a meat-pie, which we heard with serene composure in the course of a protracted sitting. Thirty-six hours afterward I began to think it funny. With some hesitation I asked my companions if they also found it funny. The idea was new to them, but upon reflection they agreed with me. It has seemed funny ever since; but only a sailor can could tell with effect. When we first went to the mountain we meant to send Harvey to Nordhoff every week or so for supplies and mail. But this journey would have taken three days, and we found that he could not be spared. A young man that worked for Soper at the bee ranch was therefore engaged to come up every Saturday, riding one of Soper’s horses and leading another loaded. The arrival of Brown, late in the evening, was the chief excitement of our life. The lantern was brought out, flaring candles appeared on the table, and we surrounded the old white packhorse, Blanco, to examine the bundles heaped upon his weary back. The rawhide bags which hung from the pack-tree were filled with parcels of tea, coffee, sugar, small groceries, powder, shot, nails, flour, and meal, can of honey, a ham, a pail of fresh butter, a peck of potatoes, onions and whatever young vegetables could be got, and on the load were a few young fowls in a sack, a box of eggs, a box of apricots, pears, and apples and a plethoric mail-bag. The carrier spent Sunday in camp, and early Monday morning he started on his return with our letters, and orders on the Nordhoff shopkeeper for next week, and sometimes presents of venison for our friends. We had a few canned meats for emergencies, but we made little use of any of them, except for corned beef, which, with the addition of potatoes and onions, furnished a palatable hash. Nor had we need to try our digestions with the coarse bacon which is sold in this part of the country, though we larded our venison with it, and fried it with deer’s liver, and now and then for a change served it with eggs. We lived almost entirely upon fresh provisions, carefully and even daintily cooked. Venison was so abundant on the mountain that we were never without it. Our hunters, after the first day or two, which they spent in learning the haunts of the game, never went after deer without at least killing one. At the foot of the mountain were shepherds who sold us lamb and mutton. About once a week some of our party saddled their horses to go marketing; they returned after five or six hours with a whole sheep, the price of which, skinned and dressed, was three dollars, without regard to age or weight. In the dry air of the mountain mutton would keep five of six days and venison longer. We tried getting beef from Nordhoff, but this experiment was a failure. After all, we had variety enough without it. We learned to serve venison in so many ways that we never got tired of it, and though it is a dry meat by nature, there is an art of giving it juices. It was set before us in the form of steaks from the legs, and chops from the loin, breaded cutlets from the shoulder, stews with potatoes and ham, haunches roasted before an open fire, haunches stuffed with vegetables (not forgetting onions), smoking and well-seasoned pies, and, best shape of all, brown and tender saddles. I am sure that nobody can roast a haunch better than Harvey. It was a day of grand ceremony when, some majestic buck being ready for the fire, our woodland sailor took command of the kitchen. 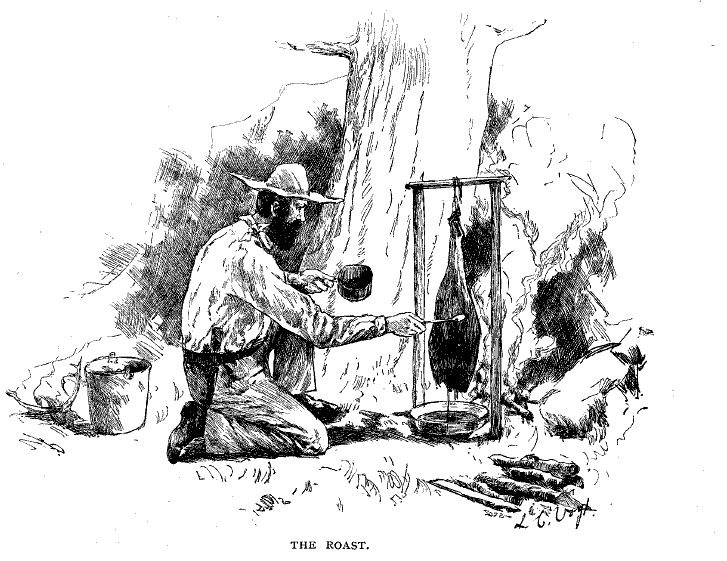 He made sure that the flesh was in prime condition; he collected dry oak fuel, which would give lives coals without smoke; he larded the haunch well; he hung it by a twisted string; he basted it judiciously as it revolved; he made a good gravy for it; and he served it hot, with currant jelly. Then he crowned the feast with his greatest triumph, a plum-duff; and, lest that mighty marine pudding should disagree with us, he brought to the campfire, when night had fallen, a kettle of boiling water, and the sugar, and a certain bottle intended for snake bites and other extraordinary emergencies. Breakfast: Oatmeal porridge and cream; deer’s liver and bacon; broiled kidneys; hot biscuits; coffee and tea. Luncheon: Lamb chops; canned salmon; honey and cream. Dinner: Soup; haunch of venison; mashed potatoes; pudding. Crockery and glass being out of the question in a mountain camp, our table service was composed of “agate-ware,” a very serviceable kind of enameled-iron, which is far preferable to tin on such expeditions, being pleasanter to use, easier to clean, and proof against rough handling which would knock tin out of shape. It is not very cheap, plates costing us twenty-five cents apiece and cups thirty cents, but when the summer was over, every article was as good as new, and was readily sold. Tin answered well enough for meat dishes, and we got a decent quantity of tin spoons and forks for a few cents each. Upon the whole our table was neat, comfortable, and attractive. 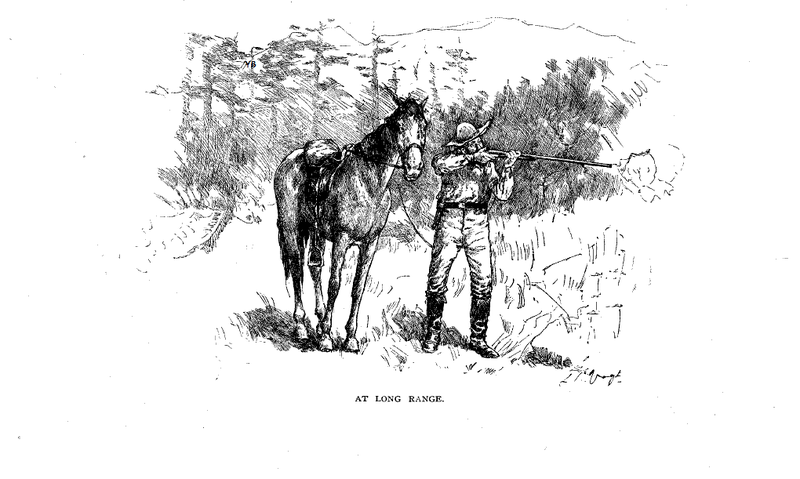 Hunting on the mountain was not without the exiting uncertainty which is essential to good sport, but the difficulty was less in shooting the game than recovering it after it had been shot. We had no dogs, and the deer always ran after being hit, sometimes getting over a surprising extent of difficult ground with a bullet in a vital part. One of Harvey’s earliest experiences with us was the loss of a fine buck under circumstances which always puzzled him. He started a buck and a doe on the north flank of the mountain, and hit them both. The doe was easily secured, but the buck, though badly wounded, sprang down the slope and was soon out of sight. Harvey traced it for some distance. 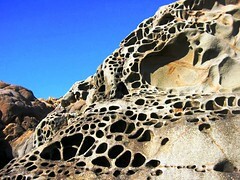 The trail was marked not only by a profusion of blood but by fragments of bone. Suddenly the blood, the foot-prints, and every other sign disappeared as completely as if the animal had been snatched up in the air. 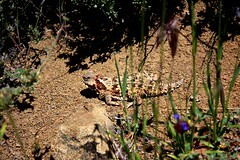 A long search, resumed later in the day with a companion, led to no result. The mystery never was solved. Below the spot where the trail ceased there was a precipitous decent, too far, one would think, to have been reached by a wounded deer in a single leap; and yet the only conceivable explanation of the disappearance is that the animal did go over it in one bound. A man could not climb down the rocks, as any detour to reach the bottom must have been very long and arduous, the quest was abandoned. The buck fell at the first shot, and lay as if dead some distance down the rocks. Thinking that it would be all that he could do to shoulder the venison, M— turned back to leave his rifle near the horse before he went after the game. He had gone about halfway down the hill, when to his consternation the buck sprang up and plunged into a thicket. 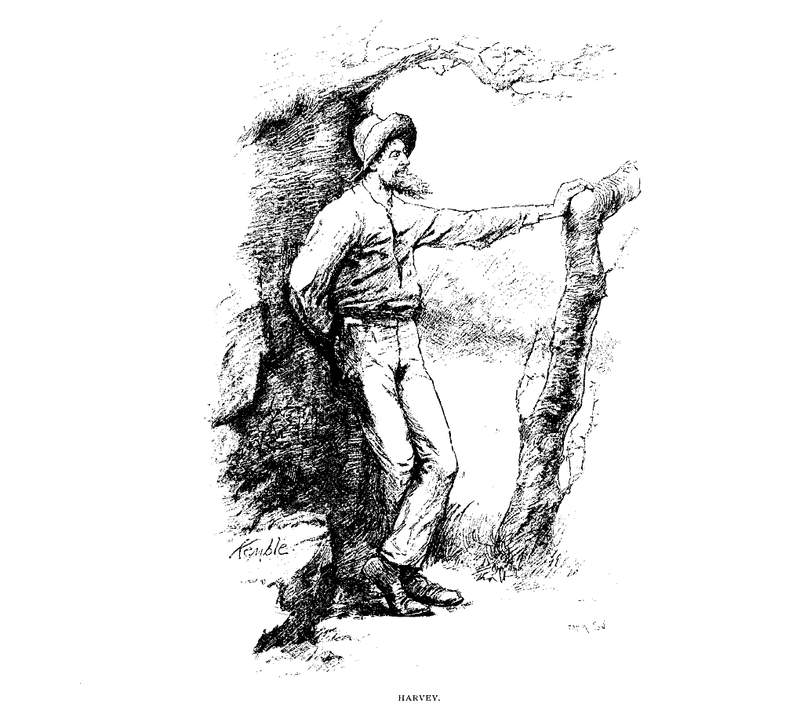 Then he had to climb back to the rifle before he could pursue; and although he tracked the buck through brush and ravines for two or three hours, he never got another shot at it. On the way home he secured a doe, but this did not console him for the loss of the largest buck any of us had seen on the mountain. Expeditions often went out for the express purpose of shooting that one rabbit. Ah Hing hunted for him with especial zeal. But nobody with a gun ever saw him. Some called him a phantom; others thought him a myth. At last, at the end of summer, when we had broken camp and were going home, there appeared to all of us, in a patch of brush close to the trail, a mighty pair of ears, and presently the jack-rabbit ran slowly across our path. He stopped to look, as our train wounded down the hill, and when he was sure that we were really going he turned contemptuously, kicked a little sand at us, and went up the mountain. Pigeons were very scarce at the summit. Quail sometimes appeared there, but all those that we saw had young broods, and we would not molest them. There is a bird called the mountain grouse that can be found on Pine Mountain by those who will look for it; but owing to its color, which is nearly that of the bark of the pine, and of its habit of perching on high branches close to the trunk, it is not easily seen except by an expert. On the very last day of our camp we found a haunt of these birds, a bare sandy place among bushes, where their footprints were as thick as the tracks in a poultry-yard. 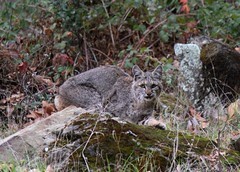 The wild cats had found it too, for their trails were distinct in the neighborhood. One day the artist, coming in from a deer hunt, discovered a mountain grouse in a tree, and brought it down with his rifle. It reached the ground in half a dozen pieces, and he had to bind up the fragments before he could carry it home. It was a hoary and solemn bird, and it seemed a sort of sacrilege to kill a venerable recluse which had probably looked down from its solitude upon a long succession of camping parties. When we proceeded to eat it, we all agreed that it was a pity it had been shot. There were fires in the valleys and canyons below us all summer, and the mountain itself in former years had been so often in flames that there was hardly a tree on it unscorched. The authors of this annual crime, which must seriously affect the scanty water supply of arid southern California, are herders who drive thousands of sheep over the government wild lands, and, when they have stripped a region, put the torch to the brush and the fire spreads to the woods. There is nothing to stop it, and nobody but the disgusted tourist cares. There had been a fire burning at the north foot of the mountain for some days, which we watched with uneasiness, for the prevailing winds were from that quarter. 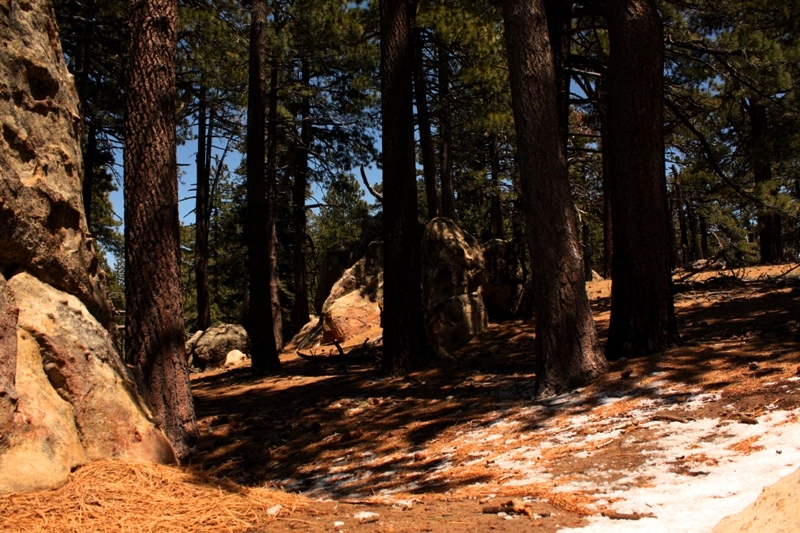 The pine forest on the side covered the whole slope. As soon as the flames got among the trees, destruction seemed to be sweeping upon us. It was a terrible but fascinating spectacle, standing on the edge of the ridge, and sheltering ourselves as well as we could behind masses of rocks from the heat and the dense resinous smoke, to look down by night into the burning wood, and watch the fall of the blazing pines and the steady advance of the conflagration, a line of fire two or three miles long roaring and crashing straight toward our camp. It was impossible to check it on the slope. We watched for two days. Then the flames reached the top, hardly a quarter of a mile behind our tents. The timber there, however, was open enough to give us a chance to fight the flames by digging a trench and kindling a contrary fire; the wind providently shifted a little, and after a laborious and anxious night the danger passed on one side. We had brought in our horses and made every preparation for flight. Our lives were in no great peril, for the trail remained free, but we came near losing all our goods, and we narrowly escaped being cut off from our only spring of water. The mountain burned all the rest of summer, and a fresh fire was started by the shepherds the day we left. And now perhaps my readers will be curious to know what comforts and what necessary outfit we carried on horseback through woods and thickets and ravines to this solitary mountain height, and how much the expedition cost. 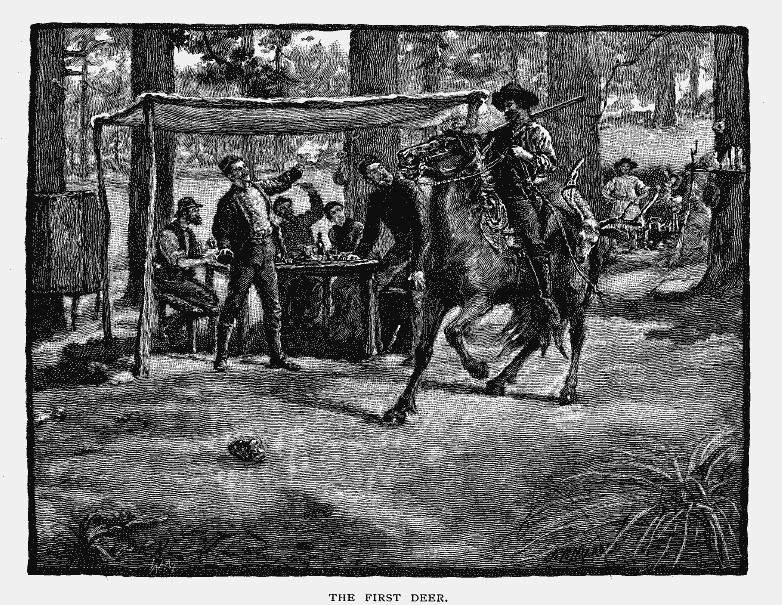 When we formed the Pine Mountain Camping Company, we agreed that each member should please himself as to his personal outfit, —tent, bedding, horse, etc., —and that everything for common use should be paid for by the treasurer out of the common fund. Three of the party had their own horses; two horses were hired at $12.50 a month each; and the use of two more was included in our contract with Soper. There was the greatest variety in the views of the company as to personal baggage. One or two were satisfied with blankets, a quilted comforter costing about $3, and a canvas bag for a few clothes and toilet articles. The price of such an outfit probably did not exceed $12. At the other extreme was the establishment of the lady and her husband. They carried a tent which cost $15 and was sold at the end of the season for $10; three pairs of blankets, worth $8 a pair; two mattresses, costing $8.75 each; two small pillows; two camp-chairs; a tin basin; a paper pail; and canvas bags containing a change of clothing. The blankets, mattresses, and some other articles were sold afterwards at half price. The total first cost of this equipment, including a few miscellaneous things which I have not enumerated, was $72, and the amount realized from the sale of the portions of it was $32, leaving a net cost of $40 for two persons. This, of course, did not include clothing: for the most part we wore what old things we had, used flannel altogether for undergarments, and carrying only one change, as washing could always been done in camp. From the sale of this property we obtained $20, leaving a net cost of $32.13, to be divided among five people. Our current supplies included, as the reader will have inferred from the preceding pages, nearly all the ordinary family groceries and a great many table luxuries also. Besides substantial provisions, such as flour, meal, sugar, coffee, tea, ham, bacon, etc., we had plentiful supplies of olives, jellies, sauces, raisins, sago, tapioca, corn-starch, cheese, dried fruits, excellent fresh butter, honey, fresh eggs, fresh fruit and vegetables. Our meat bill covered little except sheep, of which we ate five in the course of the season. For the hire of the cow we paid $10 a month. At first she found ample pasturage, but after we went up the mountain we gave her about a dollar’s worth of barley a week. We calculated the milk at about six cents a quart, which was cheap, considering the comfort we got from it. The horses fared well, foraging for themselves, until a week or two before we broke camp; then we got a little barley for them, not more than three or four dollar’s worth altogether. Or $2 a day. As we lived like gourmets, and made no great effort to economize, this, we thought, was doing pretty well. 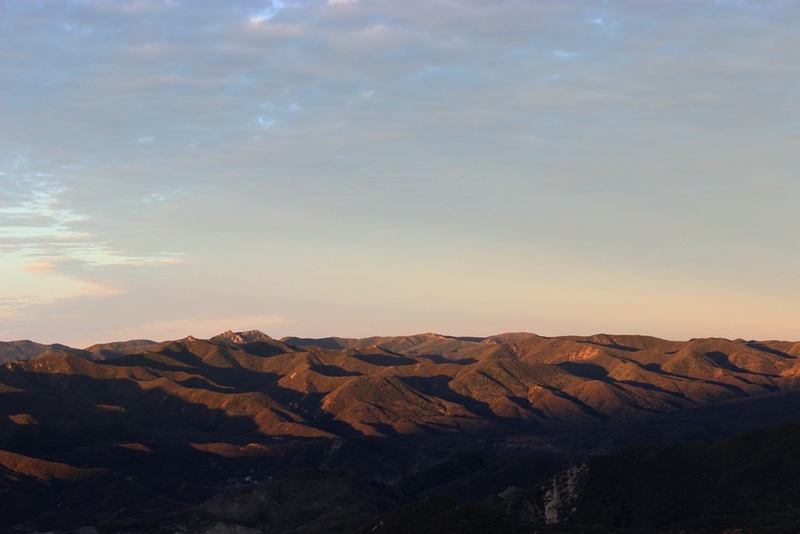 This entry was posted in Ventura County and tagged Adventure, Adventure (2), Backpacking, Camping, Hiking, Hiking (2), Nature, Non-fiction, Outdoors, Photo, Photographs, Pics, Pine Mountain, Writing. Bookmark the permalink. This was really fascinating! Thank you so much! 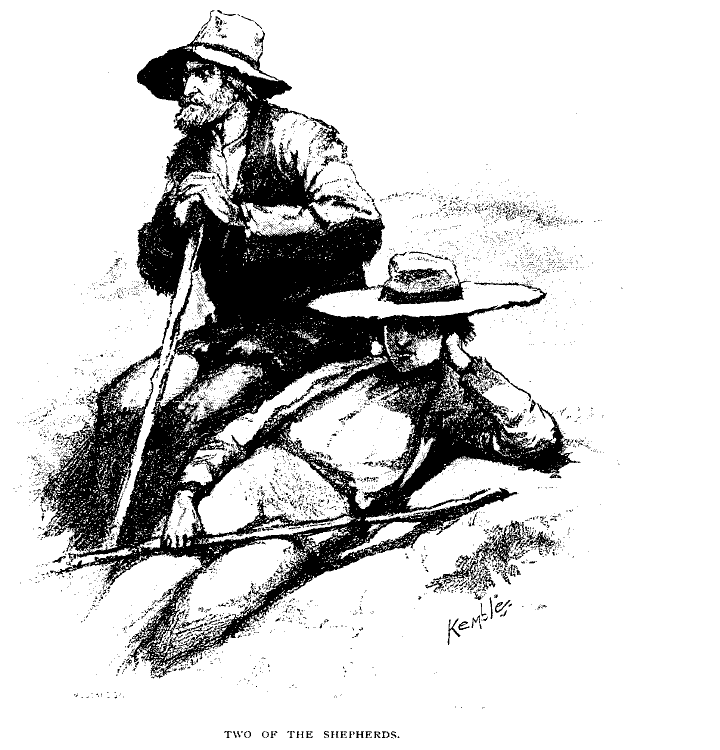 I love this historial account of camping in the later 1800s! Makes me want to give Los Padres Outfitters a call for a quote. Think they can match $2/day? With a cow and all? I found an inflation calculator and it spit that out as $48.78/day today. Not exactly on the cheap, unless you’re the guide. I think I saw that rabbit on Friday, at a very odd time for seeing jackrabbit. Fascinating read. I’m taking my time, not quite as leisurely as their pace, but just a little every day and enjoying every minute. Much of this country and history is familiar to me as I lived and worked at Wheeler Hot Springs for many years while my family owned it (1969-1993). 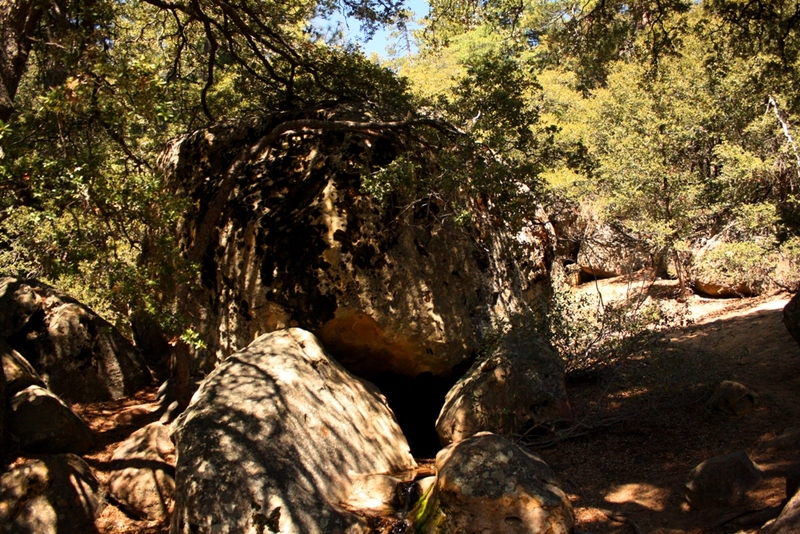 When the author refers to the Matilija Canyon route that they took he means along the North Fork of the Matilija, following what we know today as Highway 33 North, past Wheeler Hot Springs, skirting Wheeler Gorge and what is now Wheeler Gorge Campground, past Rose Valley, over the divide at Dry Lakes Ridge, down into the Sespe Valley and then up to Pine Mountain. 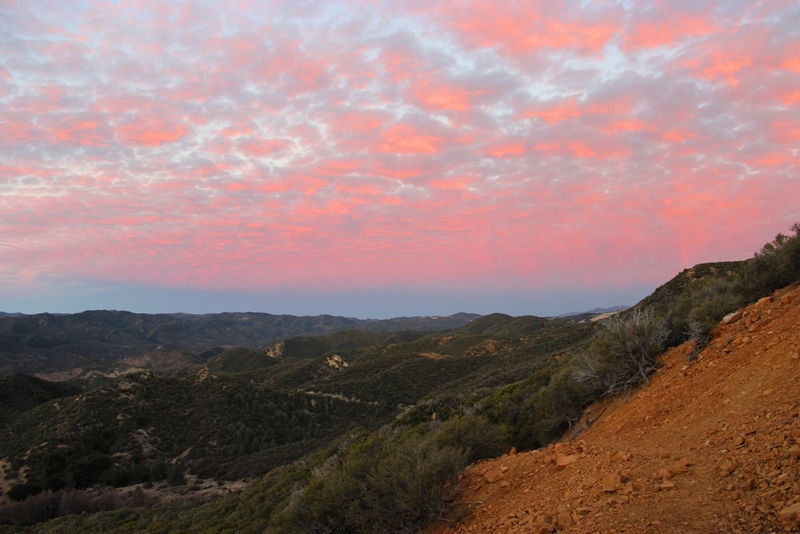 The Middle Fork and Upper North Fork of the Matilija (where they hunted during their first campout) are to be found in what we call Matilija Canyon today. Sounds like they camped that first night around where Friend’s Ranch warehouse is today, a little ways down from where the North Fork and Upper North Fork converge at what used to be “Pop” Soper’s Camp, known today as Ojala. I have to correct some misinformation I posted above. Their Matilija route could not have gone up what is now Highway 33 because there was no way in those days to get through Wheeler Gorge (known then as Castle Gorge) so maybe they went up the Upper North Fork of Matilija Creek, the trail from Matilija Campground that currently goes through Maple Camp and comes out by Cherry Creek. Just guessing now but I’m curious to know. That was my assumption about the route they took. I don’t know much about the history of the area, more than most probably, but far from any sort of expert. And as I understand it, the route through Matilija to Cherry Creek was a historic trail of some sort. I don’t recall offhand that there was a similar route at that time above the Gorge and over the mountain to the Sespe. This is a great find Jack! Thank you for sharing this. I really enjoyed reading this over a couple of days.